Designed to operate continuously with minimal energy consumption, Magnetic Drive Pumps offer a corrosion resistant body specifically for submersible use. Easy to install and maintain, Magnetic Drive Pumps are ideal for a variety of applications. All of the Magnetic Drive Pumps come with a three year warranty. 130 GPH capacity. Statuary Fountain Pump 5.5-feet maximum pumping height. 3/8-inch or 1/2-inch barbed discharge. Built-in adjustable flow control valve. 11-Watts. 6-feet cord. If, after 30 days, you are having a problem with your Little Giant, Franklin, or Red Lion product, call the Franklin Electric Tech Support Team at 888-956-0000 for Troubleshooting and Warranty Instructions. The Tech Support Team is available M-F from 7:00am-4:30pm CST. 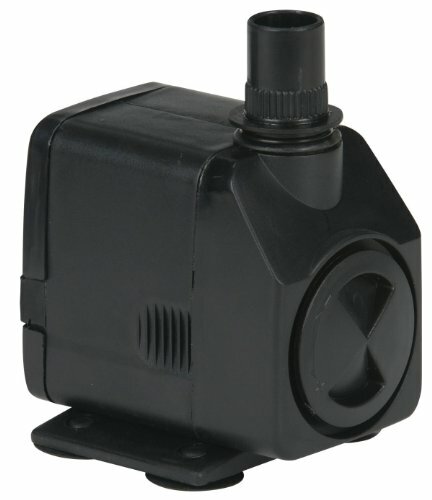 PonicsPump PP80006: 800 GPH Submersible Pump with 6' Cord - 60W… for Hydroponics, Aquaponics, Fountains, Ponds, Statuary, Aquariums, Waterfalls & more. Comes with 1 year limited warranty.